The parish of Nevay was also known as St Ringans. 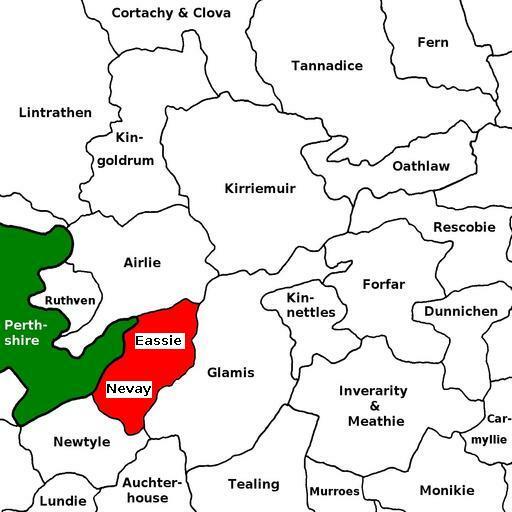 The parishes of Eassie and Nevay were united in March 1600. Eassie is roughly the north-eastern half of the united parish, Nevay the south-western half. General histories listed on the page for Books about Angus & Kincardineshire, in particular Warden, vol. 3, pp. 205-214. For the full range of maps of Eassie and Nevay, see National Library's Maps. Geograph.org: Eassie - recent photographs of Eassie. National Grid ref. NO3547. Geograph.org: Nevay - recent photographs of Nevay. National Grid ref. NO3144. 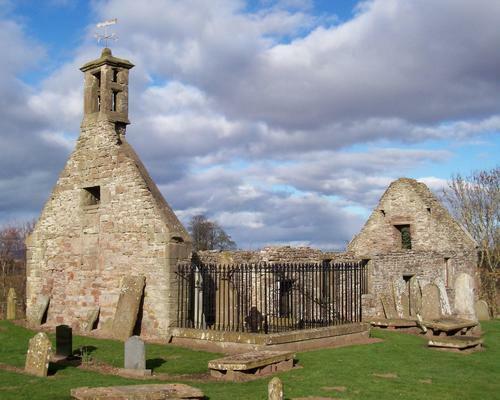 The ruined Eassie Kirk is located at National Grid ref. NO353475. The ruined Nevay Kirk is located at National Grid ref. NO313441. William Blair 1616-1617 M.A. St Andrews 1611; adm. 1616; d. 2 Feb 1617, aged ca. 26; probably unmar. Andrew Jervise recorded some monuments at Eassie in his "Epitaphs & Inscriptions", vol. 1, pp. 67-8 and at Nevay on pp. 68-9 of the same volume. 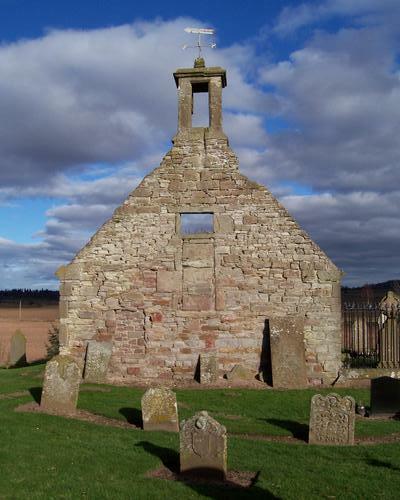 The Tyries of Drumkilbo (in Meigle PER) were buried at Nevay. There is a monument in Greyfriars Kirkyard, Edinburgh to John R. L'Amy of Dunkenny, d. 1814, and family. 1870 Erected by PETER and HELEN PATTULLO* in memory of their children EDWARD born 20th March 1863 died 16th March 1870 ISABELLA SMITH born 31st Decr 1864 died 6th April 1870 Sacred also to the memory of the above PETER PATTULLO, late farmer, Eassie, who died 25th May 1884 aged 61 years. MARGARET, their eldest daughter born 27th March 1857 died 29th September 1899. HELEN widow of PETER PATTULLO born 3rd Decr 1828 died 7th Feby 1914. Also their sons FRANK, died 1918. THOMAS, died 1927. PATRICK, died 1934. And their daughters HELEN wife of JAMES MELVILLE died 14th Dec. 1956. ELIZABETH died 10th April 1957. Erected by JAMES DEMPSTER, in memory of his wife ANN SCRIMGEOUR, who died 28th Octr 1893, aged 72 years. JOHN SCRIMGEOUR, her father who died at Balgownie Mill 22nd Sept. 1882, aged 89 years. BELLA & RICHARD DEMPSTER grandchildren, who both died in infancy. Also to the memory of the above JAMES DEMPSTER, who died at Balgownie, Newtyle 13th Sept. 1909, aged 88 years. Eassie & Nevay was in the Commissariot of St Andrews.